Our Puppy Liaison Officer, John Austin, is happy to help and advise prospective Newfoundland owners. Working with the Puppy Liaison Officers of the UKs other two recognised Breed Clubs, John is often aware of reputable breeders who have or are expecting litters. A Newfoundland can be the most wonderful companion and a joy to own, provided you can furnish it with the care and attention it needs. 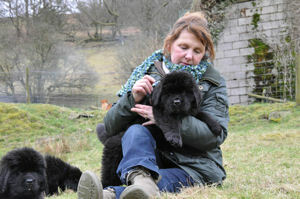 The last thing we want to do is put anyone off owning a Newfoundland but be aware of what you are taking on ... that adorable cuddly bundle of fluff as a puppy will grow very fast into a large, powerful dog who needs the right environment and care for you both to have a happy life together. 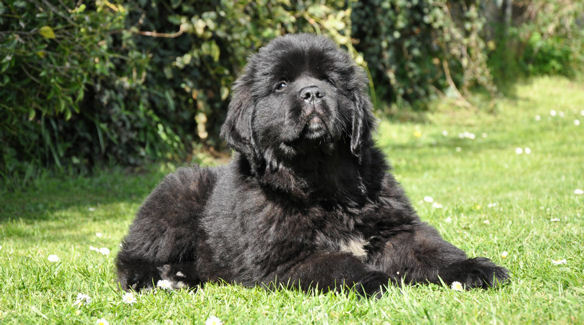 Have you the time to raise a Newfoundland puppy correctly so it is well adjusted, sociable, confident with people and with other dogs? If you work full time and there isn't anyone at home to take care the dog DO NOT buy a puppy (of any breed). 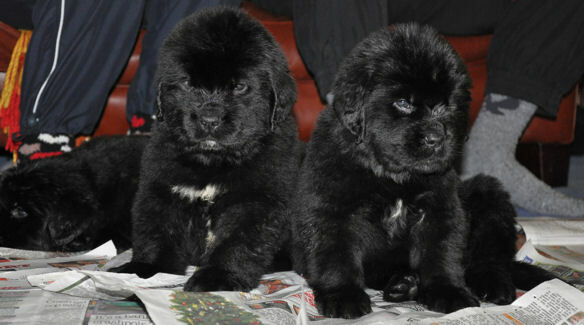 Newfoundland puppies have to be fed four times during the day since they have a huge amount of growing to do. Have you the time to exercise a dog every day in all weathers? Adult Newfoundlands need a fair amount of off-lead exercise, preferably in the country with swimming a preferred activity for many. Have you got the space (indoors and out) for a dog that will grow into a giant weighing 8 to 12 stone? Forget coffee tables and prettily positioned ornaments - a Newfoundland is like a charging elephant when playing and is no respecter of your precious things. Have you the time to groom your dog thoroughly and regularly? Newfoundlands have huge dense double coats which will quickly become matted without constant brushing and combing. Are you house-proud? If you are fastidious about cleanliness DO NOT buy a Newfoundland!! Their oily coats mark the walls and furniture, their huge muddy paws will play havoc with your carpets, and they positively enjoy shaking when wet. They also slobber! A Newfoundland is a four-legged disaster if you want a sparkling, sweet smelling home! Can you afford a larger car or van? - Newfoundland owners often drive big estate or utility vehicles, specially kitted out vans or large people carriers. It's not because they are rich, you just cannot fit a Newfie into a mini!! Do you like to be warm in winter with your central heating up high? Forget it! Welcome to the world of open windows and doors all year round. 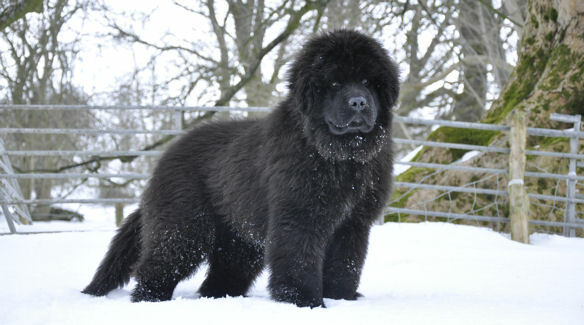 Newfoundlands hate the heat and are happy in cold conditions. Sitting in snow drifts or swimming in a cold lake or sea is normal for a newfie and a walk in a blizzard is the greatest fun as far as they are concerned! Can you afford the vet bills or high cost of insuring a giant breed? 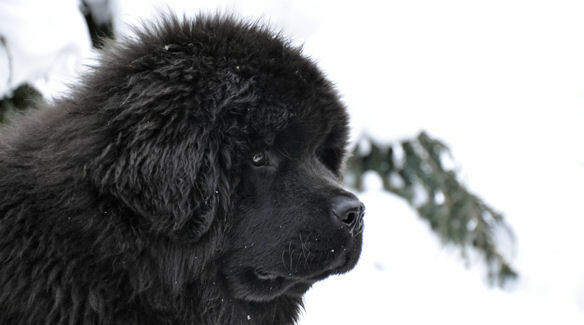 There are certain hereditary health problems in Newfoundlands e.g. 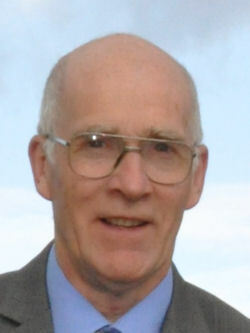 heart disease, which can run into thousands of pounds for treatment. We stress the importance of buying from a reputable breeder who has done all the health checks demanded by the Northern Newfoundland Club but even then unforseen issues can arise. Do you have very young children at the toddler stage? If so, it may be better to wait a while. Although Newfoundlands generally adore children, a huge and heavy dog can be overpowering for a young child. If you have answered all of the above questions honestly and still feel a Newfoundland is the only dog for you then there is probably no escape ... you have been bitten by the Newfie bug! 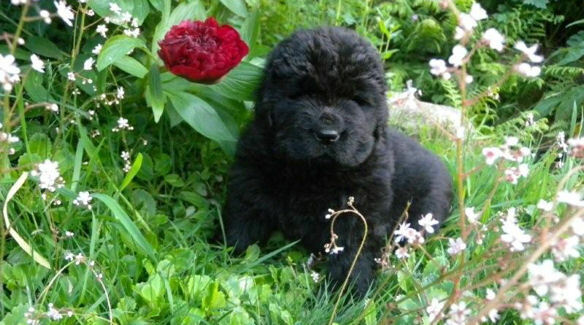 Newfoundlands are known to be addictive and you will probably end up with more than one!